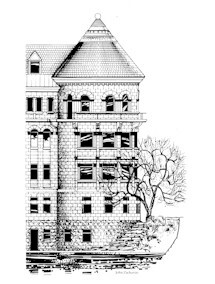 Once again this year on October 2nd in the lobby of McGill’s Arts building, students from the Faculty of Science will present their research projects at the tenth annual Undergraduate Research Conference (URC). 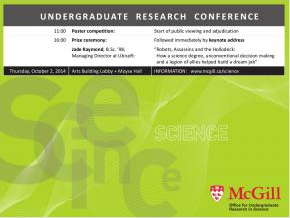 All the projects will be entered into a poster competition judged by a panel of distinguished McGill researchers. Keynote address and reception will come after the prize ceremony. This all day event is open to everyone. See details here. I recently came across the Undergraduate Research Commons and thought I should share it with you. 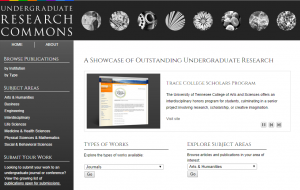 It is a portal where you will have access to hundreds of full-text undergraduate research papers from a large number of participating educational institutions worldwide. These include engineering capstone projects, faculty-supervised research, award-winning papers, peer-reviewed journal publications and so on. You may browse by participating institution or type of documents, and find out the popular papers in each subject area. Of course, it also allows users to search by keywords. If you are interested in exploring the content, simply click on the info graphic at the left-bottom corner of the homepage to regroup the content by different criteria. Welcome / welcome back! I wanted to bring your attention to some free resources, such as Massive Open Online Courses (MOOCs), that may help support your studies. I know, classes have just begun so the last thing that you are thinking about is enrolling in another course but there is some great material out there to help reinforce or expand your learning. We have a new guide to MOOCs and open education resources (OERs for short) on our Schulich Library site. These include places where you can go to register for courses, but also options for viewing course materials, such as MIT’s OpenCourseWare, or for taking advantage of openly available textbooks in science and engineering. I’m currently following (when I can) a Linux MOOC and waiting on Writing in the Sciences from Stanford.